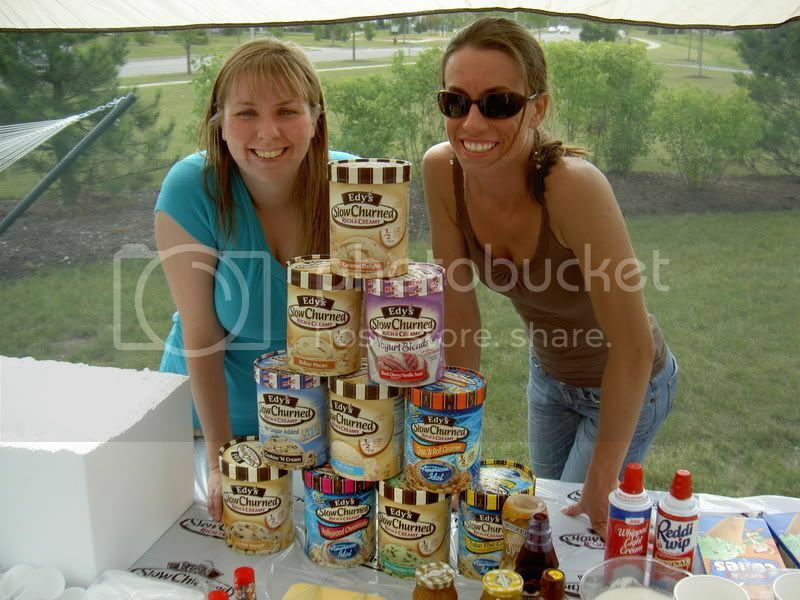 WIN FREE EDY'S ICE CREAM FOR YOUR NEIGHBORHOOD!! Hey guys.. sorry I've been MIA again. I *just* heard Edy's is doing their "why my neighborhood rocks" block party contest again this year. I won 2 years ago and also convinced a few of my neighbors to enter. My neighborhood was lucky enough that we had 2 winners, myself and one other neighborhood so we got double the ice cream and products. Basically to enter, write a story about your neighborhood and enter it to EDY'S ICE CREAM BLOCK PARTY. It's easy to enter and surprisingly I won. 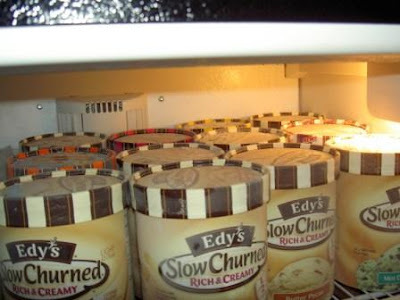 About 4 days before my party I recieved a box filled with dry ice and I believe 12 different selections of Edy's slow churned ice cream. ok... here goes. deep breath. I have this life.. this life of less than 6 degrees of separation. Somehow, in the strangest of circumstances I find other people who know each other and every time I tell these stories it seems that people think it's the funniest thing how these situations play out.. yesterday, while proving to be an interesting situation, it weighed heavy on my heart leaving me with this gut feeling that there may be a reason my day played out the way it did. A reason I became involved. The day started out very normal. I got to work and had a short conversation with my boss asking each other about our weekends. She told me about a bunco game in her neighborhood that was being held in honor of a 5 yo boy who had a brain tumor. At the end of the night instead of splitting the pot so the winner could take the winnings and the other half given to the family of this little boy it was decided that all the money thrown it would go to this family. Her husband is a fireman and her family has roots in our community so it's not uncommon for her to be pitching in to help another family. After work I got home and my neighbor next door rang my bell to BRING ME COUPONS! Okay how good do I have it that people BRING THEM TO ME! So we started talking and she started telling me how she's been spending her days. She was recently laid off so she was explaining to me that a friend of hers who I know has a son that is very ill. She started explaining that her 5 yo son has a brian tumor and that the family needed help and has a huge calendar on line where you can go on and sign up to help the family. She told me about a few fundraisers that were being planned and I couldn't believe I had missed all this considering I am a FACEBOOK friend with the mom of this little boy. At this point I had totally forgotten the conversation with my boss early the SAME MORNING. So another neighbor comes over and we had a few errands we were running together, so my first neighbor left to go finish making dinner. I ran my errands, came home, and while out I saw a Porsche that was a few years younger than mine... so that reminded me IT HAD BEEN WEEKS since I had been on my European Car club website. I log on and immediately there are people talking about a meetup they are trying to plan. Along with them was a member I had never talked to before so we started talking and she informed me of a fundraiser she was trying combine in with a meetup for our club. As soon as she mentioned the name of the bar I knew this was the same little boy my neighbor had just talked about just 2 hours earlier to me. When I asked if it was "Cin's little boy" the girl was shocked (I've never met this girl from my car club before because she had left for awhile and I just joined). So as things worked, we took over the entire conversation on the car club website so I asked if we could move over to a private area. So I asked if she had yahoo IM, AIM, Myspace IM, skype, or Facebook. Of course, she has FB. After she gave me her name and I sent her a friend request, I realized we had a little more in common. Facebook shows you in common friends.. well automatically I see "Cin" and then the girl across the street from me!!! What. Not the girl who brought me coupons but another girl! So I ask, "how do you know her?" winds up they work together! So I tell her the girl who lives next door is how I know Cin & her family so how is it that she is friends with the girl who lives across the street but not the girl next door. She doesn't know the girl next door at all because she went to high school with Cin! Weird huh? Anyway.. because of the girl from my car club I wound up being able to get links to all the websites and calendars for this little man's battle plan. Okay here is how you can help!!! If you are in the Chicago area and shop at Jewel, on his site are links to the coupons that can be used for Shop and Share days. These are days in which if you bring these little coupons Jewel will donate 5% of your purchase towards the family for medical expenses. So as you can see, for some reason throughout my day yesterday everyone was telling me about Carter. I very honestly believe that everything happens for a reason, and maybe I don't yet know what the reason is.. but I can start by passing the message about Carter and way that you can do something HUGE for him without really having to do much more than print out a piece of paper and hand it to the cashier when you pay for some groceries. Sounds like a win/win situation to me! Over at HUNGRY GIRL she has cooked up some deals on diet friendly foods including a 50% off deal with the HEAVENLY DIET STORE for simply using the code hungrygirl. The only stip is that your order must be over $30 which is easy to do ordering anything off the HG approved section on their site. What do you bring for POT LUCKS? Okay.. everyone out there has their "signature dish" that they bring to pot lucks, pig out days, fat days, whatever you wanna call them.. depending on where this is being held, work, a families house for a special occasion, at church, or at a club meeting. There is one dish that you *always* make either because you love it or because you aren't allowed to come without it. I have a few and they've changed over the years. Not sure why but I do try to mix them up. Here are a few I've done over the years. dressing - mix 2 cups of mayo with 2-3 T lemon juice and dillweed. put the dressing on top, spread around. add a little shredded cheese and a few green onions on top for garnish. Right before digging in mix the dressing into the salad otherwise you got wise guys eating just the dressing/top and a bunch of lettuce at the bottom. you can do this one with other flavors like raspberry as well. okay I learned this one from an old Italian mama type from New York. It turns out super yummy and it's easy. this is all by sight. I fill a bowl with the tomatoes then drizzle around some olive oil. next I put about 2 teaspoons of garlic in and add in the salt/pepper/basil last. It's all about how you like it. I get french bread and slice it up and then toast it. I like to make this at least 8hours before servings so the flavors blend. Super garlic but ooh so yummy! tomatoes, green onions, olives sprinkled on top. I don't make this as neat as this picture looks. I normally just chop the veggies up very fine and throw them on top. I usually do carrot, green pepper, white onion, broccoli and then I put shredded cheese on top. If missed my MASHED POTATO BAR post go back and check it out. This is one I learned from a neighbor of mine. Super great, super easy, super yummy, super crowd pleaser. I use sausage sliced up in chunks or the little cocktail wieners. throw it all in the crock pot with equal amounts of grape jelly and chili sauce. Let it "cook" through on low maybe 1-2 hours depends on how done you want them. Put a ladle out and toothpicks with little plate. Easy. Okay.. so what are your signature dishes? What do you bring? What is easy and cheap? What do we have in our stockpiles that we could bring? WHOOO HOOO REDBOX IS AT IT AGAIN!! Luckily I have great sources like FRUGAL DR MOM to keep me informed!! Thanks Dr Mom! !